The Tetra GloFish Aquarium Kit is a convenient and suitable home for your new pets. It is large enough to hold 2 -3 fishes although some experts may feel just two is enough. However, GloFish love schooling unlike other smaller fish like Bettas. So if you can afford the extra one three can do well in the tank maximizing all the resources. This five-gallon tank is the perfect one for newbies and your children. Maintenance is easy, space occupied is small, but it is large enough to hold a couple of fish without feeling cramped. The Tetra glofish aquarium kit measures 11.25 x 16.56 x 6.71 inches and is made of acrylic material. It takes on a crescent design with the front curved increasing its appeal, and the plastic is seamless all through increasing its structural integrity. The tank features a clear plastic canopy which comes with a detachable blue overhead LED light. The top of the canopy is also fitted with a feeding hole enhancing the convenience of using the tank. The LED hood serves to keep the fish from jumping out and also reduce evaporation. There are as many as 15 blue LEDs are hidden in the hood which augments the lights of the fish giving them a vibrant look. The Kit also comes with a Tetra Internal Filter, a Tetra Medium Filter cartridge and an instruction manual. The aquarium's internal filtration system features both mechanical filtration and chemical filtration. It has Ultra-Activated carbon which removes odors and discoloration. On the mechanical side, the filter pulls up the water from the aquarium and pushes it through the filter cartridge which has a dual-sided, dense mesh that traps debris and other waste. The use of ever-changing led lights helps simulate different seafloor water conditions for the fish making the environment more conducive for them. The acrylic used is highly durable and scratch-resistant. As already mentioned the tank can hold five gallons of water, and the whole kit weighs just over 3kgs. It is perfect for kids and newbies allowing them to learn about caring for fish as pets without being too much of a hassle. Setup and installation including fixing the filter system is easy and straightforward. Maintenance and cleaning is simple given the size and even changing water is a breeze. The filter is silent therefore not irritating even when the tank is placed in the children's bedroom. Adds a great appeal to the home and only needs a few decorations to enhance the overall appearance of the tank. Is small to fit only a maximum of three fish comfortably. Several major accessories are lacking, and you have to purchase them independently. The filter pump has been found by most people to be a bit underwhelming, therefore requiring an upgrade filter pump. 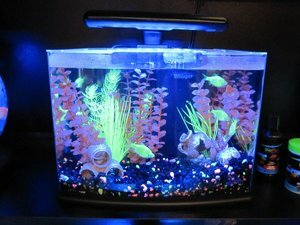 The Tetra GloFish Aquarium kit may be just what you need to either surprise your children or start you off on the journey of pet fishes and aquariums. It does not make a hole in your pocket but still delivers a significant fish aquarium for your money. It allows you to own some of the most beautiful pet fishes while adding a clear aesthetic statement to your home.